Mariette - Angliae Scotiae et Hiberniae. Title: 'Novissima descriptio Angliae Scotiae et Hiberniae'. A striking and highly detailed copper engraved map of British Islands, including United Kingdom, Ireland and portions of Netherlands. The map gives several details concerning cities, villages, lakes, rivers, islands, The title is inside a ribbon style cartouche. 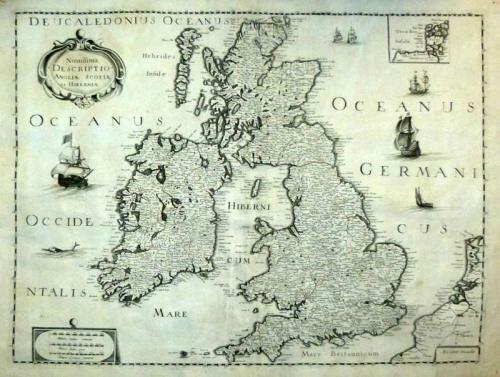 The map is adorned with several sailing ships, galleons and sea monsters. Inset map of Orkney Islands to top right quadrant. Condition: Very strong and dark impression on good paper. Paper with chains and wiremarks. Uncoloured as issued. Wide margins. Cartographer: Nicholas Sanson (1600 - 1667) and his descendents were important French cartographer's active through the 17th century. Sanson started his career as a historian where, it is said, he turned to cartography as a way to illustrate his historical studies. In the course of his research some of his fine maps came to the attention of King Louis XIII who, admiring the quality of his work, appointed Sanson "Geographe Ordinaire du Roi". Sanson's duties in this coved position included advising the King on matters of Geography and compiling the royal cartographic archive. Sanson's corpus of some three hundred maps initiated the golden age of French Cartography. He is most admired for his construction of the magnificent atlas Cartes Generales de Toutes les Parties du Monde. Sanson's maps of North America, Amerique Septentrionale (1650) and La Canada ou Nouvelle France (1656) are exceptionally notable for their important contributions to the cartographic perceptions of the New World. Both maps utilize the discoveries of important French missionaries to the interior and are among the first published maps to show the Great Lakes in recognizable form. Sanson was also an active proponent of the Insular California theory, wherein it was speculated that California was an island rather than an peninsula. After his death, Sanson's cartographic work was carried on by his sons, Guillaume (? - 1703) and Adrien Sanson (? - 1708), as well as by A. H. Jaillot and Pierre Duval, with whom the partnered.